I just wanted to offer a brief update to the community re: my health. (For context, read: “A New Diagnosis to Add to the List”). In December/January, I had three surgeries: a craniocervical fusion and two surgeries in my lumbar spine to remove a hematoma that was compressing my spinal cord (a complication from a prior blood patch) as well as a tethered cord release, a condition I was probably born with. 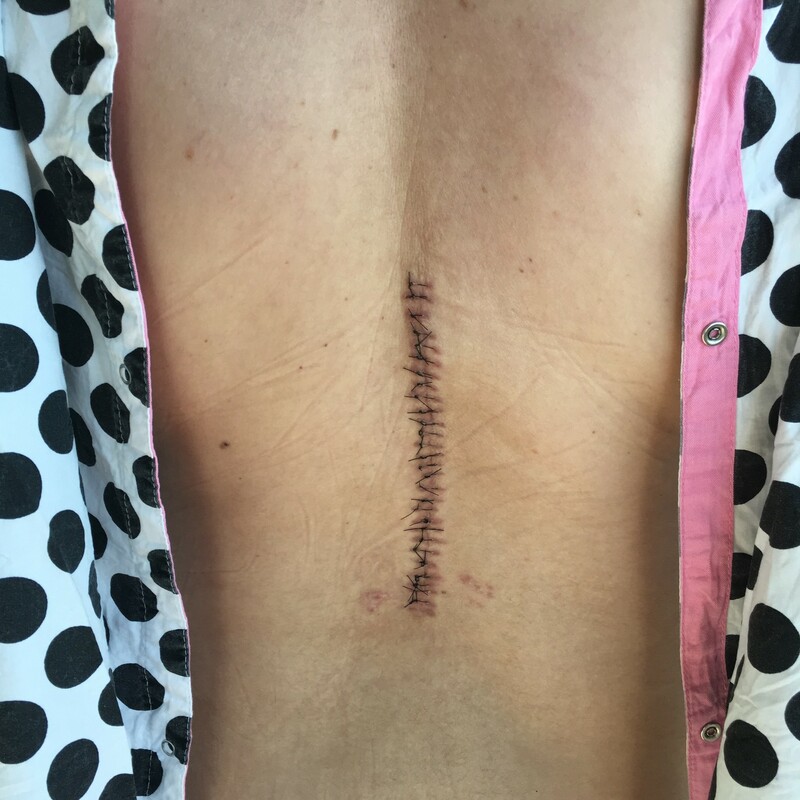 The surgeries were a success: the craniocervical fusion corrected my central apnea as well as neurological symptoms including the numbness and weakness I was having on the right side of my face and arm. The hematoma removal + tethered cord release corrected the bilateral numbness, weakness and pain I was having in my legs. I can stand up straight, no longer have to sleep in a fetal position, and for the first time since July, don’t have to worry I will suddenly stop breathing. While the surgeries have contributed to my well-being and were all absolutely necessary in my case, it’s unclear what effect they have had on my systemic symptoms. I still have MCAS. I still have POTS (although lately, it seems to come and go). Right now, I am largely bedridden — to be clear, a familiar state of affairs for me these seven years— but I am able to do more out of bed with each passing day. Whether or not I still have PEM is hard to say as I am not well enough to crash myself. Or at least, my energy envelope is beyond the scope of what I am mentally and physically able to do given the weakness, pain and deconditioning from my surgery. The side effects from medication have been, to put it mildly, rough. I am still not back to my 2017 baseline, when I was well enough to travel and promote Unrest. In short, I have no miracle to announce and do not know what effect, if any, these surgeries have had on my systemic symptoms. But these are early days. While it is up and down, I’ve been improving every week. Before doing a surgery like this, my surgeon is very careful to make sure his patients understand that surgery is not a panacea. That it will not in many cases correct the systemic conditions like MCAS or POTS, let alone, PEM, although surgery has improved or resulted in remission of these symptoms in some cases. He considers surgery a last resort, an option for patients with more severe presentations of craniocervical instability when conservative interventions have failed. While it is true that some patients do experience remission or improvement of systemic symptoms, we simply don’t have the data to quantify or describe what the impact of these surgeries are on people with ME who don’t meet the traditional EDS criteria. All the EDS surgeons say that 50% of the outcome really depends on the patient. What they mean is that the investment patients make in physical therapy and rehabilitation the 12 months after is really important for maximizing the benefit of the surgeries. Unfortunately, we don’t know a lot about what an ideal physical therapy plan looks like for someone with ME. I think I will emerge from this stronger in the long run. I encourage everyone who thinks a CCI diagnosis might apply to them to get that diagnosis so you can at a minimum better protect and care for yourself and explore conservative treatment options. If you are a surgical candidate, I highly encourage you to go slow, research all the options, seek second opinions, talk to other patients, understand the risks, and to think not just about the surgery but about pain management, your personal reaction to anesthesia and medications, and your post-surgical care plan, which may require additional care-taking at home as well as a plan for physical therapy. Thank you everyone for your kind thoughts and well-wishes. Wife of @owasow. Maker of @unrestfilm. Plotter of revolution @MEActNet.